Having three daughters, the oldest almost 16, I have over a decade of birthday party throwing experience. With that said, my oldest two are like night and day, they have very different interests. Hailee loves fashion, makeup, and everything that sparkles. Abby, on the other hand, loves video games, comfy clothes, and as a child aspired to be a magician! Unicorns are all the rage right now, and for good reason – they are adorably cute! 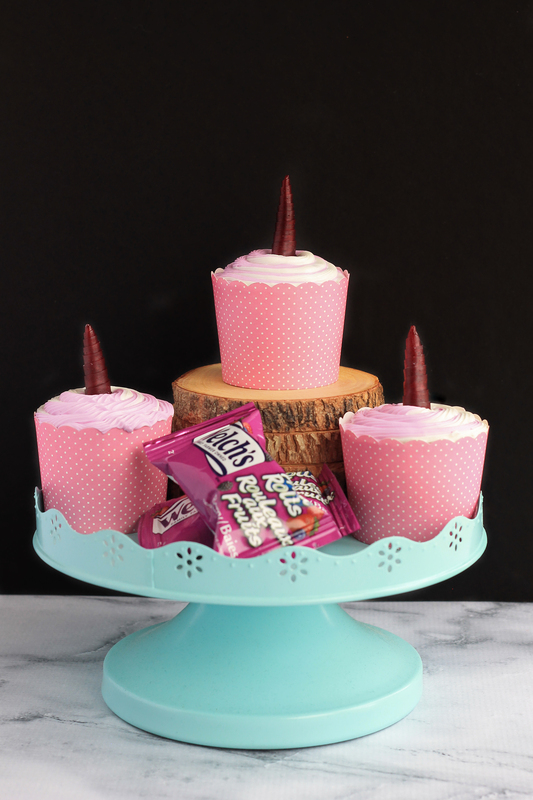 If your daughter is asking for a unicorn themed party keep reading because I’m sharing a super easy recipe for unicorn cupcakes and more. I’m always thinking outside of the box when it comes to recipes. 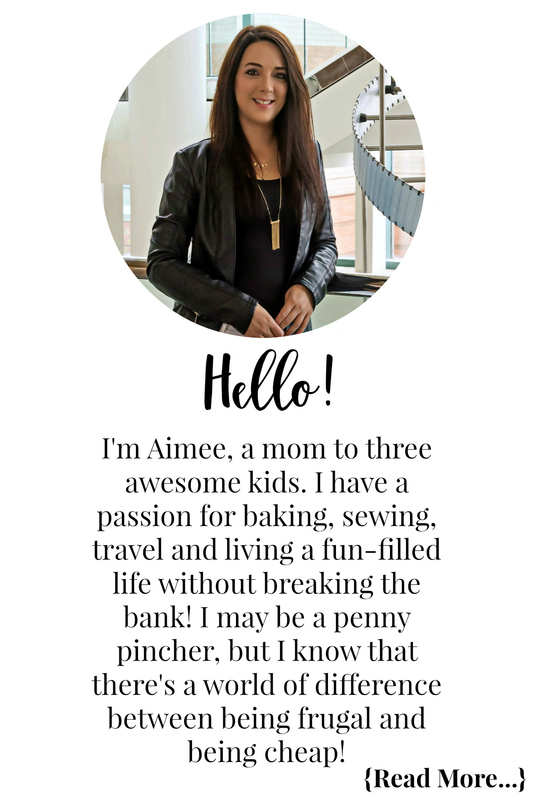 Coming up with unique ways to use products we love, have on hand, and are easy is important to me. Having three school-aged children, my cupboards and shelves are always stocked with their favourite snacks, and Welch’s Fruit Rolls is always one of them! Not only do Welch’s Fruit Rolls make the perfect unicorn horn, they are my go-to snacking choice for the girls. Welch’s Fruit Rolls make on-the-go snacking and lunch box packing a breeze for this busy mom. 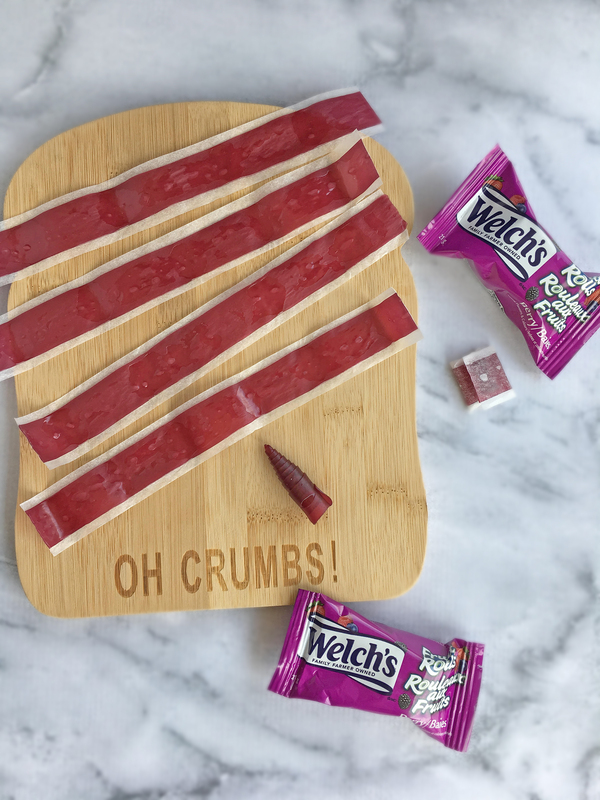 As a mom, ingredients are an important part of our snack choices, and Welch’s Fruit Rolls first ingredient is fruit! They also contain 100% daily value of Vitamin C, and 25% daily value of Vitamins A & E.
Of course, the kids have to like what they eat, and my girls love to “Unroll the fun” with Welch’s delicious, fun to eat format! They are widely available at grocery stores, including Walmart, and come in a box with 18 fruit rolls. 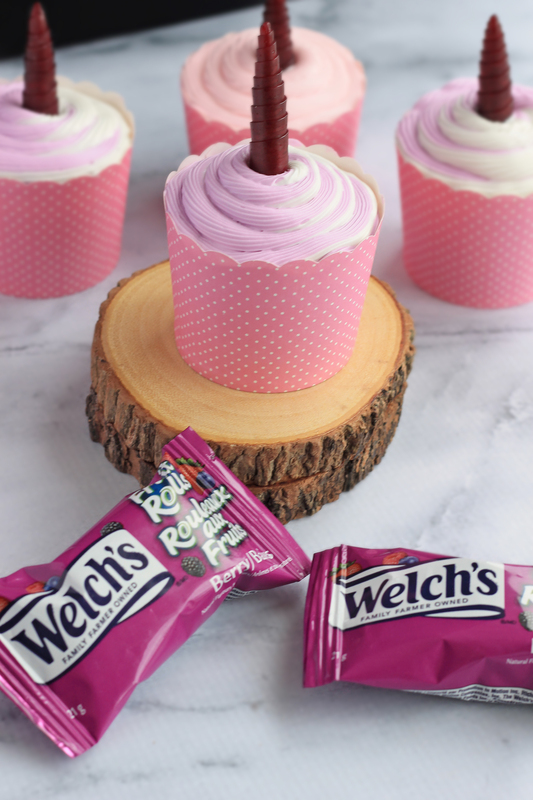 If you know me, you know I love to save money, and right now you can save $1.00 off Welch’s Fruit Rolls with this printable SmartSource.ca coupon. I know, I know, parents hate loot bags. But guess what, kids love them and I am one of those moms that always throws a little something together for the kids who attend! 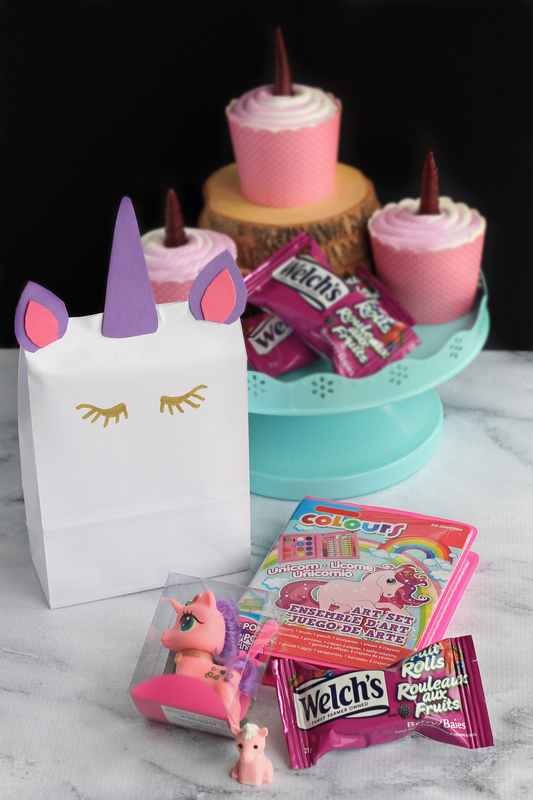 If you are throwing a unicorn themed birthday party you can create a super cute, yet easy, loot bag to hold their goodies. To make the unicorn loot bag I picked up some small white bags from the dollar store, free-handed a horn and ears, then drew on some pretty eyes. If you are not down with free-handing, there are tons of free printable unicorn templates online you can use. Of course, I picked up some unicorn themed goodies at my dollar store for the kids loot bags. 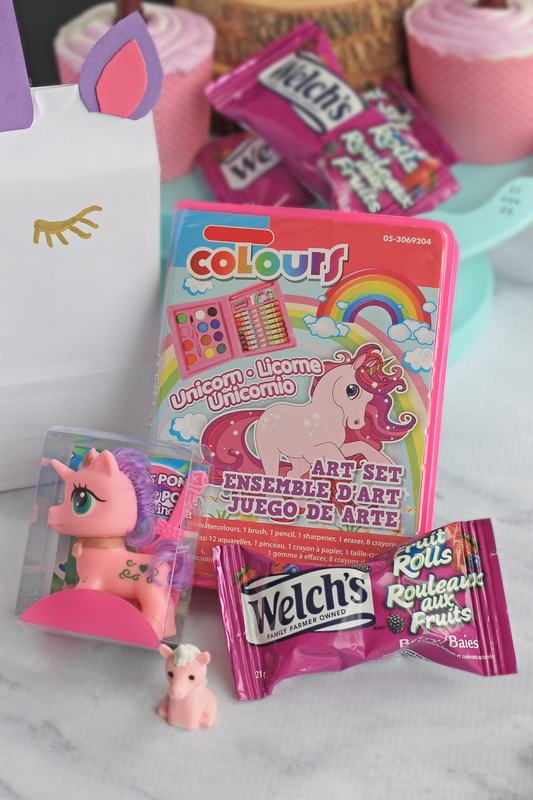 There is a little unicorn eraser, unicorn toy with brush, and even a unicorn mini art set! I prefer not to give kids loads of candy in their loot bags, you’re welcome parents, and instead I toss in treats like Welch’s Fruit Rolls! 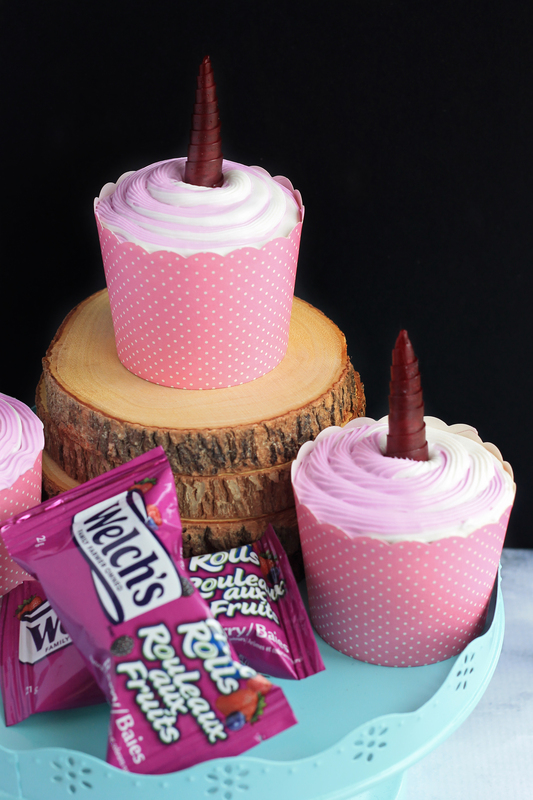 So now that loot bags are done we can move on to the next star of the party, these adorably easy unicorn cupcakes! While I love to bake, I have always struggled with icing cupcakes, so believe me when I say that anyone can create these. 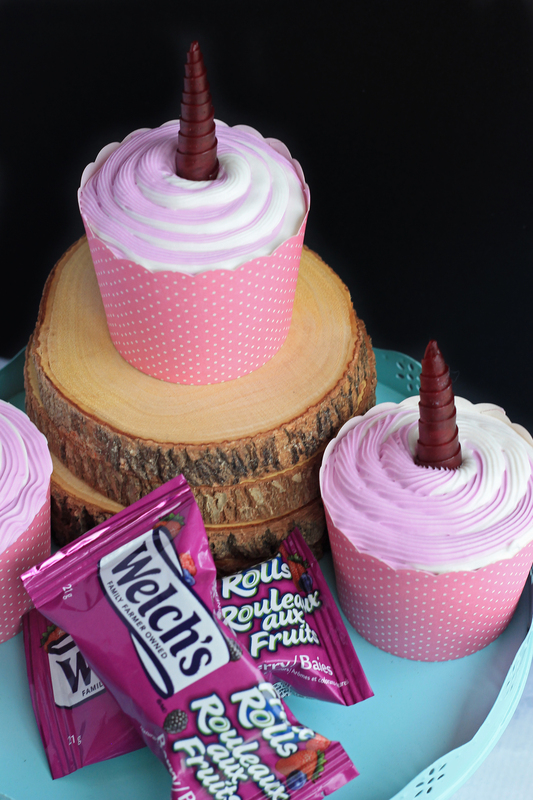 First things first, you will need to create your unicorn horns using Welch’s Fruit Rolls. 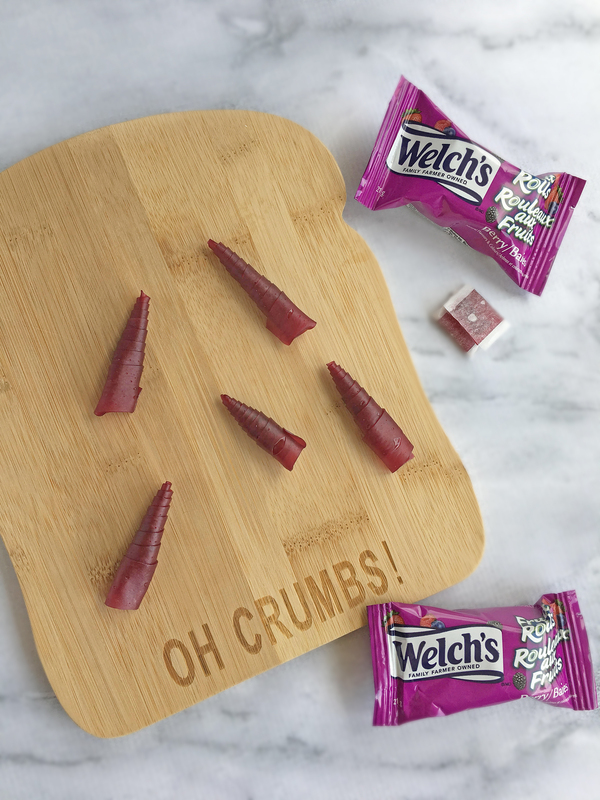 Each package of Welch’s Fruit Rolls will yield 4 unicorn horns. Cut the folded part at the end off and let the kids can munch on those. Fold your roll in half and cut. Immediately fold in half again and cut. Strip by strip, starting at one end on a slight angle, roll your fruit roll into a horn. Tuck in the bottom piece to finish. Repeat this until you have enough unicorn horns for the number of cupcakes you will be making. Next it is time to bake your cupcakes. Using the recipe below, bake your cupcakes and let them cool. Once they are cooled it is time to decorate & enjoy! Bake your cupcakes according to the directions on the box. Let cupcakes cool completely before decorating. 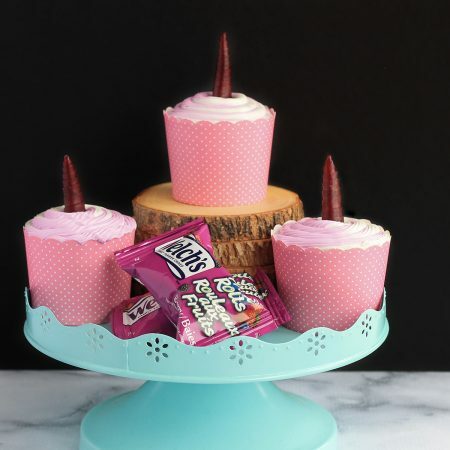 Place your cooled cupcakes in a decorative cupcake cup. Put one can of icing in a bowl, add a few drops of your desired colouring, and mix well. Scoop your coloured icing into a large plastic bag. If wanting a swirl effect, put a can of white icing into a large plastic bag. Adjust the icing down to one corner of the bag, flatten, and then snip the corner. In another large plastic bag snip the corner and place an icing tip into it. Slide in both flattened bags of icing, one on top of the other, down into the corner. Twist up the excess bag at the top and squeeze to get the icing going. Start at the edge of your cupcake, working your way to the middle in a circle squeezing the icing onto the cupcake. Once you have iced your cupcake place your unicorn horn in the middle. And if that isn’t enough unicorn for your party, you can also make these Whimsical Unicorn Headbands for the party guests!